Turns out maintaining a presence in the social network only makes life more complex for a film critic. I had to delay my viewing of Godzilla 'til Sunday, meantime trying to avoid the various hosannas and the occasional nay-say being splattered all over Facebook, Twitter, etc. 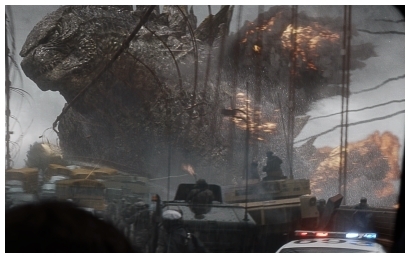 An impossible task, actually, and I went into the theater a little anxious over whether what little feedback had filtered through to me was somehow going to skew my reaction, for good or ill.
Happily, I was well pleased with Godzilla. Not staggered, no, but grateful that director Gareth Edwards managed to pay homage to the history of the franchise while adding some crucial elements to the exercise, elements that I explore in my review for WBAI 99.5FM's Hour of the Wolf. Click on the player to hear the review, or right-click the title to download.